Who needs a 990-PF form? The 990 PF form is filed by the eligible exempt private foundations, nonexempt charitable trusts treated as private foundations and taxable private foundations. What is the purpose of the IRS form 990-PF? The Return of Private Foundation form is an information report that must be filed by organizations exempt from Federal income taxes under section 501 of the Internal Revenue Code, and whose annual receipts are normally more than $25,000. Form 990-PF is used to determine taxes based on investment income, and to report charitable distributions and activities. What other forms must accompany the IRS form 990-PF? The authorized representative may also need to file Form W-2, Wage and Tax Statement, Form W-3, Transmittal of Wage and Tax Statements, Form 940, Employer's Annual Federal Unemployment Tax Return, and Form 941, Employer's Quarterly Federal Tax Return. When is the IRS form 990-PF due? 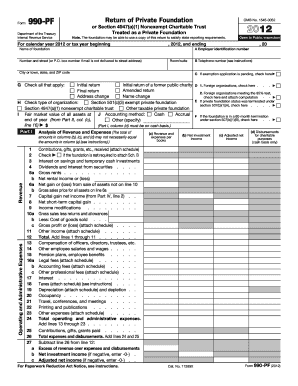 There is no specific date to file the form 990 PF to the IRS. The nonprofit's filing date is decided by the end of its fiscal year. The filing organization must submit the form by the 15th day of the 5th month after the completion of its fiscal year. What information should be provided in the 990-PF form? While completing the form, the filler needs to give the foundation's EIN along with detailed information about revenue and operating and administrative expenses. Follow all the instructions and complete the required sections (the required sections depend on the type of the foundation). Contact the local IRS office in case any questions occur. The preparer has to sign and date the form. What do I do with the form after its completion? 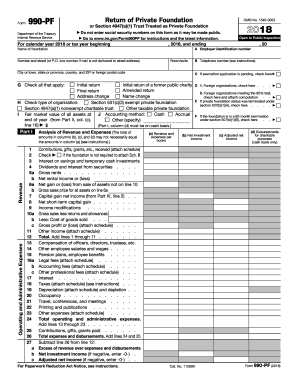 The completed form is filed with the IRS. Forward the Return of Private Foundation to Department of the Treasury Internal Revenue Service Center Ogden, UT 84201–0027. 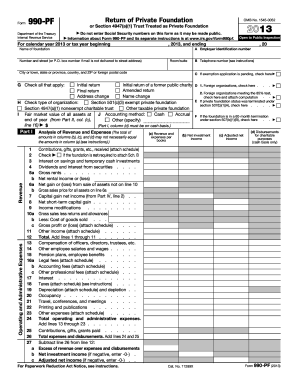 Jan 21, 2016 ... See the Form 990 filing thresholds page to determine which form(s) an organization must file. ... Form 990-PF · Instructions for Form 990-PF. Mail – Please enter the information into our fillable PDF forms, print, sign, and mail the forms to: Charitable Trust Section PO Box 30214. Lansing, MI 48909- 7714. Cat. No. 11289X Form 990-PF 2018 Page 2 Balance Sheets Attached schedules and amounts in the description column should be for end-of-year amounts only. Cat. No. 11289X Form 990-PF 2013 Page 2 Balance Sheets Attached schedules and amounts in the description column should be for end-of-year amounts only.